11.2018 The Java driver contains an update for the fast T12 processor. The ADwin driver, cost-free as usual, is now available for your download. Benefit from the features of the flagship processor! 08.2018 The current Python module is now available in the Python Package Index. The package is always kept up-to-date, making Python module updates conveniently easy. 06.2018 The module CAN-FD-2 for ADwin-Pro II provides 2 interfaces for the improved CAN protocol. CAN FD (Flexible Data Rate) allows an faster bit rate: 8-times higher data rate and enhanced error detection. 03.2018 The processor T12 enables fast real-time now even for big Simulink models. The model runs with absolute timing precision and predictability reaching sample rates up to 1 MHz. 03.2017 ADwin software products are ready for the use with Windows 10. The real-time development environment ADbasic, the handy ADtools and the complete line-up of ADwin drivers are now compatible to Windows 10. 03.2017 The ADwin software package for Linux 2.6 und Mac OS X 10.12 is online. The driver supports ADwin processor T12 now and provides several function improvements. 06.2015 The revised ADwin driver for C / C++ (version 2) supports multi-threading applications, which allows to access several ADwin systems in parallel. The driver also enables the data transfer of Double values from and to the processor T12. 01.2015 "Kallisté for ADwin", an object-oriented development software dedicated to test engineers, is now provided free of charge to all ADwin users. The software package has access to ADwin hardware right from the start and allows data acquisition, test benches supervision, test data analysis, test reports and more. 11.2014 The SENT input interface SENT-6 for ADwin-Pro II is a further step to automotive electronics. The module can evaluate SENT messages (fast channel and slow channel) on 6 channels in parallel. 09.2014 The analog output modules AOut-4/16 and AOut-8/16 for ADwin-Pro II are now available as variant with a TiCo processor. The processor allows for individual data output routines on all 16 Bit channels and therefore disburdens the ADwin processor. 07.2014 The SENT output interface for ADwin-Pro II is our next stepafter the SENT input moduleto automotive electronics. The module can output SENT messages on 4 channels in parallel: Either an alterable message continuously or a sequence of freely defined SENT messages. 06.2014 The new processor Pro II-CPU-T12 convinces by Giga-performance: 1 Gigahertz clock, 1 Gigabyte main memory, 1 Gigabit Ethernet interface. All this makes the 64 Bit FPU 5 times faster than its predecessor CPU-T11. As a special feature the T12 can also run C code embedded into ADbasic code. 05.2014 With a new Gigabit Ethernet interface the T11 processor transfers data to the PC considerably faster. Optionally the CPU module is available with a USB or SATA memory device (up to 2 TB), which you can access from the T11 as well as from the Ethernet network. 04.2014 The new development environment Kallisté contains all tools data acquisition, test bench supervision and test data analysis. The environment is programmed graphically and may be enhanced by own modules. Kallisté can access ADwin hardware right from the start and is therefore its ideal software partner. 01.2014 The LS-2 module for ADwin-Pro II enables the access to 2 proprietary, bi-directional LS-busses with up to 15 bus members each. An available bus member is the HSM-24V module with 32 digital inputs and outputs for 24 volts, short-circuit proof. 12.2013 The multi I/O module MIO-D12 for ADwin-Pro II provides a variety of digital inputs and outputs: optically isolated inputs, transistor outputs, counters, and SSI decoder. 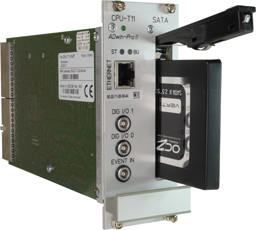 The TiCo processor enables autonomous reactions to digital trigger signals and data output. 11.2013 The Pro II module SPI-2 provides two interfaces, each freely configurable as SPI-Master or SPI-Slave. Bus devices are addressed via TTL-I/Os. The MISO / MOSI communication is configurable to a large extent. 10.2013 With a frequency of 50 MHz the Pro II module AOut-1/16 sets a new standard for the output of analog signales. The module supports creation of complex wave forms from segments. 32 TTL I/Os are provided in parallel to the analog output. 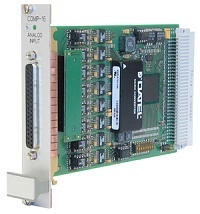 09.2013 The module Pro II-Comp-16 provides 16 channels with 50MHz comparators. If the applied analog signal exceeds a comparator threshold (adjustable from −1V .. +30V), the module sets the appropriate bit to 1 or 0. A selectable hysteresis, hold of comparator values and filtering of error pulses permit precise processing even of unsteady or noisy signals. 08.2013 With Pro II interfaces to MIL-STD-1553 and ARINC-429 ADwin provides access to two widespread avionic data protocols. For the MIL bus, the SMT bus monitor vis available. The ARINC interface offers one transmitter and two receivers, which can operated at the same time. 06.2013 The SENT receiver interface for ADwin-Pro II opens the next door to automotive electronics. The module can evaluate 4 SENT signals (fast channel and slow channel) in parallel The clock frequency is automaticyll recognized, different message formats CRC modes are selectable. As a special feature the check for specified sensor types can be selected. 10.2012 ADwin software products are ready for the use with Windows 8. The real-time development environment ADbasic, the handy ADtools and the complete line-up of ADwin drivers are now compatible to Windows 8. 02.2012 Newest member of ADwin-Pro II family, that is the digital module Pro II-DIO32-TiCo2. The module and its Virtex-6-FPGA can detect or output digital signal patterns to a precision of 5 ns. The TiCo2 (Timing Controller) enables reaction times of less than 100 ns. In addition, user-definable signal voltage levels make the module applicable most flexible. 12.2010 The multi I/O module MIO-4 for ADwin-Pro II is an autonomous allrounder for all types of signals, combining a fast reacting TiCo processor with analog and digital IOs. Thus, the intelligent plug-in module reacts independently to measurement values and events and disburdens the main processor, for example as fast controller, digital filter for analog signals, function generator or intelligent threshold monitor. 01.2010 We like to thank Keithley Instruments for 15 years of successful cooperation. The distribution of ADwin systems via Keithley Instruments comes to an end at the beginning of April 2010. With immediate effect, ADwin customers can benefit from the advantages of direct delivery, including both our qualified hardware support and professional assistance for software applications. 10.2009 Jäger Messtechnik has updated all ADwin software products for Windows 7. Starting with ADbasic, the user interface for development of real-time test and control systems, coming to the handy ADtools as well as the broad range of ADwin drivers, all are now compatible to Windows 7. 02.2009 ADwin-Pro II has got new analog input modules with 4 or 8 channels, equipped with a 16 bit ADC each. Using burst instructions the module performs complete measurement sequences on its own – the sampling rate being up to 4 MHz. Measurement values can optionally be buffered in the on-module memory with 256 MB size. 10.2008 You want to test your Simulink model on a hardware? ADsim combines your model with ADwin's real-time capacity. At the push of a button you compile the model, transfer it to the ADwin system, and the model runs with pre-defined speed, absolutely exact and predictable. 11.2007 More than a new version: the real-time development environment ADbasic now ships as version 5 featuring a large number of improvements. Automatic code completion, display of declarations as well as code snippets are available now - real-time can be so easy. 10.2007 Beginning from autumn 2007, ADwin systems with Ethernet interface are delivered with a built-in web interface. This allows the operation and visualization of entire test stands from your web browser - world-wide. 06.2007 The ADwin-Gold family has got a fast new member. The ADwin-Gold II offers 10 times more calculation power, higher accuracy, a large number of interfaces and has the TiCo on board. 03.2007 In time for CeBIT 2007, Jäger Messtechnik has updated all ADwin software products for Windows Vista. Starting with ADbasic, the user interface for development of real-time test and control systems, coming to the handy ADtools as well as the broad range of ADwin drivers, all are now compatible to Windows Vista. 11.2006 Our new ADwin driver supports Apple Mac OS X. As known from Windows, Linux and Java, also Apple users working with C or LabVIEW now easily access ADwin devices and benefit from precise real-time functionality - with microsecond accuracy. 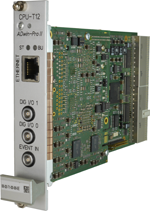 07.2006 ADwin-L16's I/O capacity can be extended by up to 15 modules wih 32 digital 24 V inputs and outputs each. The I/Os are short-circuit-proof and can be configured in groups of eight. The HSM-24V can be mounted on the classic DIN rail and is equipped with screw terminals for signal connection. 06.2006 With ADlog you use your ADwin system flexibly and without programming effort for recording, visualization and evaluation of large data amounts with sample rates up to 4.8 MHz. 06.2006 ADwin supports the scientific open-source program Scilab, working with the operating systems Windows and Linux. 06.2006 The analog modules for ADwin-Pro II offer resolutions up to 18 -bit and speeds up to 50 MHz. You can store up to 256 MB of data on the modules. 05.2006 Develop new applications with the ADwin-Pro system using the completely new Pro-II bus and the T11 processor. 10.2004 The Pro-TC-8-ISO module processes thermocouple signals directly and provides the thermovoltage or the temperature in °C oder °F. Suitable for thermocouples of the types E, J, K, N, R, S, T.
02.2003 The ADwin-Gold system with D-SUB connectors for inputs and outputs. Optionally available: Gold-CAN with interfaces for CAN, RS232 / RS485 and SSI-encoders. 02.2002 The comparator input board for ADwin-Pro has 16 digital channels with individually adjustable switching thresholds, perfect for precise switching even when you have noisy signals. If you wish to make a personal date with us on the trade shows or if you would like to get tickets, please contact us.